With primary focus on converting vacant, abandoned and tax-delinquent properties in the country to assets, and putting them to productive use for community revitalisation, the government is on the look out for creating land banks in Sri Lanka. Lands State Minister T.B. 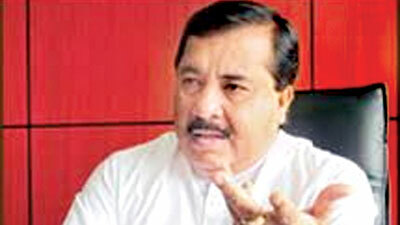 Ekanayake yesterday said action was afoot to set up the first land bank in Sri Lanka by the end of March. "We are planning to have one land bank in every district," he said. "The envisioned land banks will be created as public entities pursuant to authority provided in a government-empowered legislation," Ekanayake said. Asked to explain how the public will benefit from the new land bank, the minister said the people will be able to purchase land plots from the bank at much lower rates than from private real estate companies. "One of the biggest problems the country is facing today is that the public can hardly imagine to fulfill their land acquisition needs due to higher prices at which the lands are on sale by the real estate companies," he explained. "The land banks can eliminate this blight and be of solace to the public," Ekanayake said. Asked if the government had identified lands to be acquired for this purpose, the minister said they have launched a survey throughout the country through local authorities to check out on government lands that have been vacant and abandoned or tax-delinquent properties. Asked if this was not going to give them an unfair advantage over private companies, he said it is not and added: "We are more likely to address problems associated with a growing inventory of 'problem properties' which private market has altogether discarded. "We are going to need an investment in repairs in respect of some of these properties that may have clouded titles, neighbourhood liabilities among other issues. We are going to present the details of our land bank programme to the Cabinet once we get full details of our land survey across the country, which is conducted by grama sevaka niladharis and others."